In this tutorial we will show you how to install the free TinyMCE Advanced plugin. This allows you to customize the default editor and adds tools for creating tables, searching & replacing text, as well as many other options. This is helpful if you do not want to use HTML directly in the WordPress "Text" editor. Type 'tinymce advanced' in the search field. 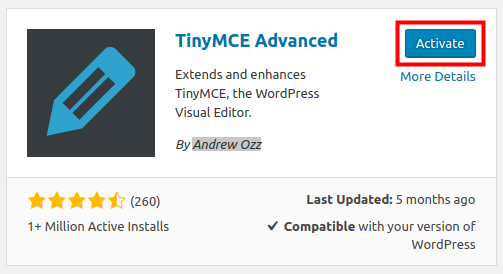 Click the Install Now button next to the TinyMCE Advanced plugin by Andrew Ozz. When the installation completes, click the Activate button. Now when you edit a Page or Post in WordPress You will see additional options in the editor. You can also click Settings, then TinyMCE Advanced to add more buttons to the editor. Congratulations, now you know how to install the free TinyMCE Advanced plugin in WordPress. In the next guide, we will show you how to Customize the WordPress Editor with TinyMCE Advanced.